I believe it was a container for some kind of kitchen supply, vinegar or oil, maybe even wine or alcohol. Very cool piece and in perfect condition, no chips or cracks. The lids are a little rusty though, may want to replace, clean or not use them if storing liquid in them. Gorgeous for a shabby chic French spa look in your bathroom. 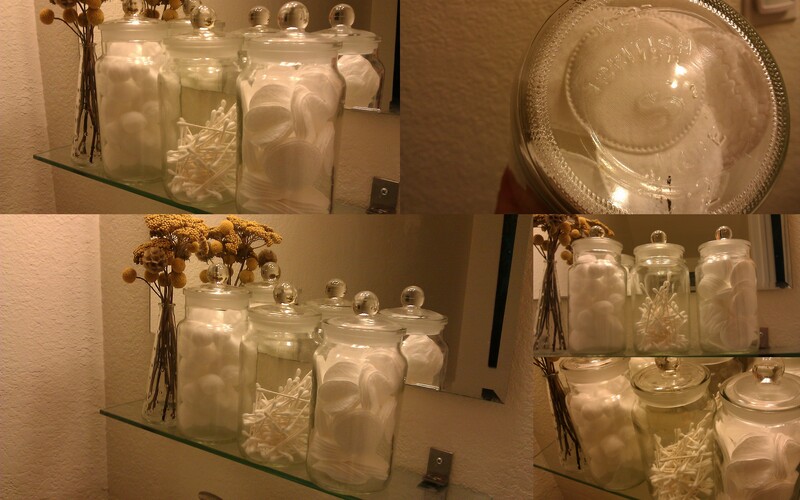 Use them to store bubble bath or bath salts. Use as a vase with a single bloom. Very Pretty! Vintage Glass Apothecary Storage Jars, Bottles; Kitchen or Bathroom glass storage bottles. *SOLD* THREE large antique glass apothecary storage jars, bottles. These are from the 1940’s. One is slightly taller than the other two, All are British made. Two are marked British Made S x237 and the taller one is marked U758 British S Made 2. These are in wonderful condition. No cracks or chips in the jars, two lids have chips on the inner lip( they don’t show when placed in jar and are not sharp to the touch.) Perfect for you vintage, shabby chic restoration hardware look. 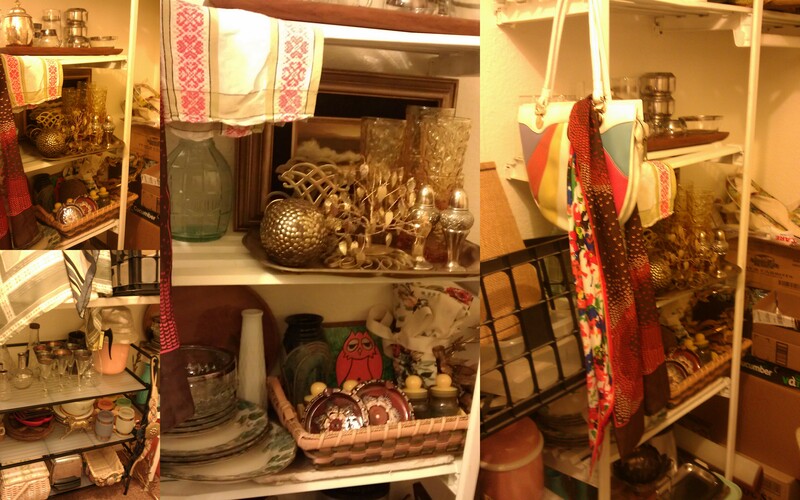 Use for the kitchen, bathroom or decor. They would look awesome with toiletries, bath salts, soap or decorative shells. Dimensions: The taller one is 8-1/2″ tall no lid, 10.5″ with lid, 4″ diameter base. The shorter two are 8″ tall no lid, 10″ with lid, 4″ diameter. 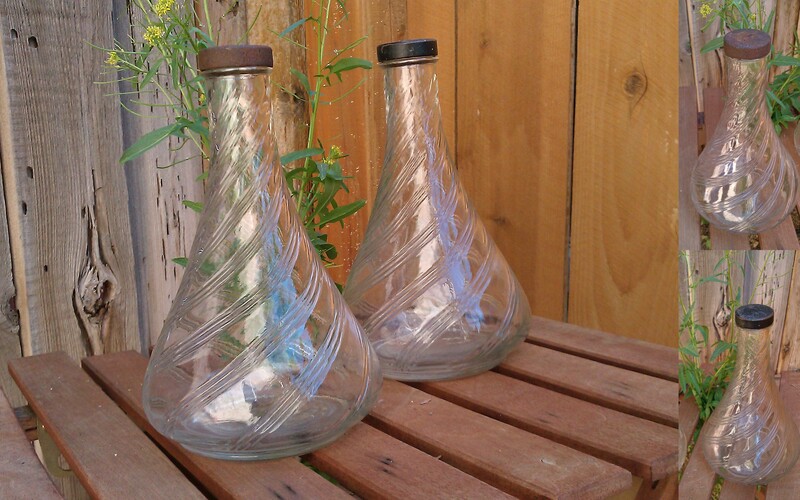 SOLD**TWO antique Apothecary jars, bottles from the early 1900’s. Used in pharmacy’s for storage of medicines or cotton swabs. They would amazing full of toiletries for a shabby chic bathroom decor or filled with lavender bath salts for a French spa.They are both marked WTCo USA on the bottom. No chips or cracks in bottle or glass stoppers. Very cool and pretty as a vase or used for storage. Amazing condition for their age. Dimensions: 10″ tall and the opening is 2″ wide. 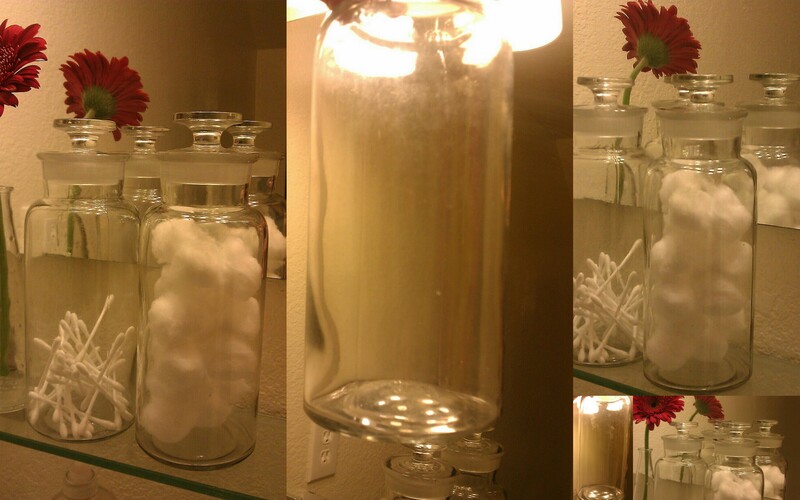 Comments Off on Vintage Glass Apothecary Storage Jars, Bottles; Kitchen or Bathroom glass storage bottles.